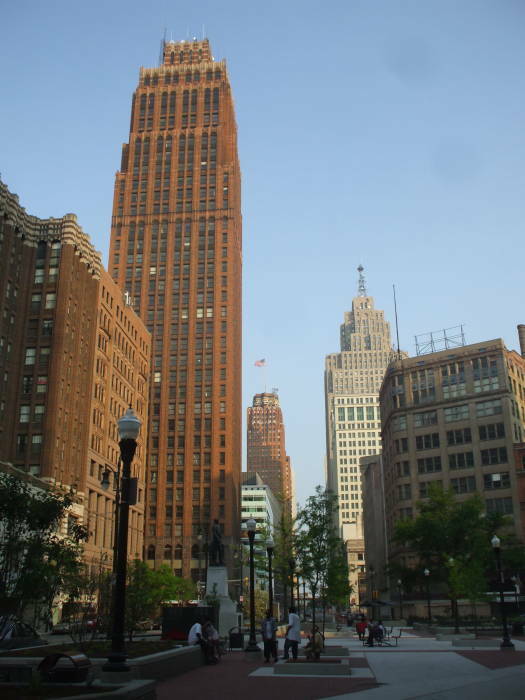 One day I trekked north on Woodward Avenue from the northern Downtown area through Midtown and on north to New Center and the Fisher Building and Cadillac Place. I stopped for a long visit at the Detroit Institute of Arts along the way. 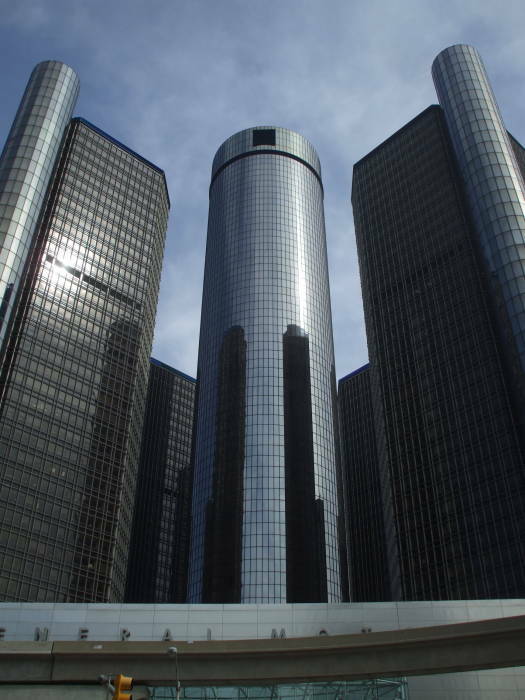 The last of General Motors' employees moved out of Cadillac Place to the Renaissance Center on the waterfront in 2001. 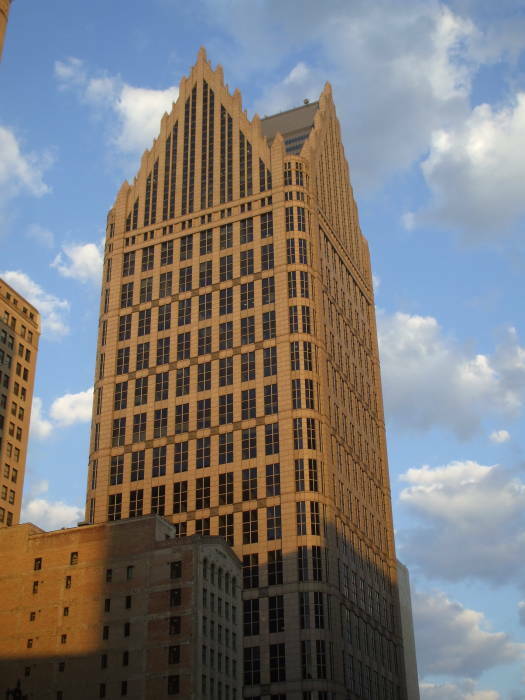 Cadillac Place now houses over 2,000 Michigan state employees. 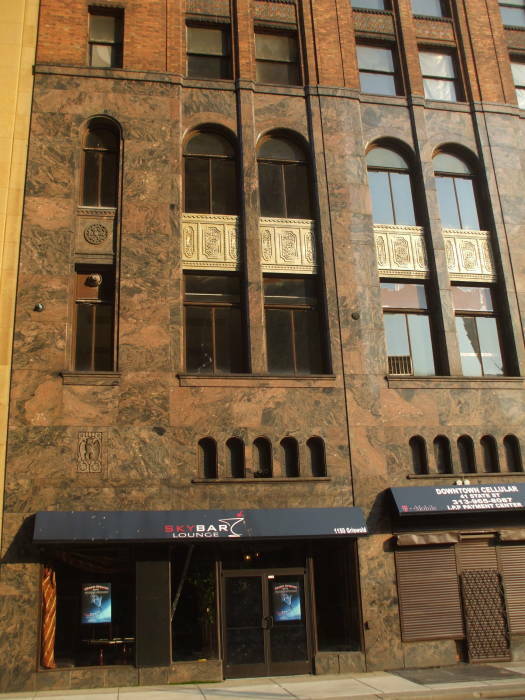 The building was the state of the art for the 1920s. General Motors had left behind nearly 1,900 window air conditioner units. A major renovation in 2002-2003 installed a central air conditioning system. 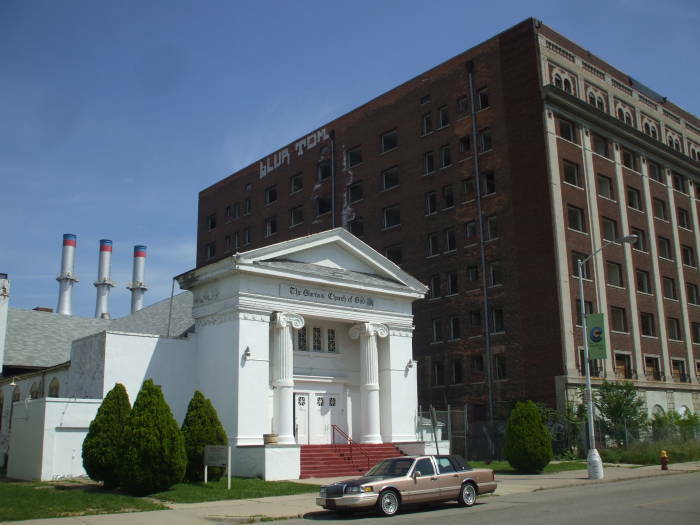 Along the way I passed the Detroit Medical Center, and this large vacant building on Alexandrine. The Garden Bowl, under the yellow metallic facade seen below, is the oldest continuously operating bowling alley in the United States. It was built in 1913. 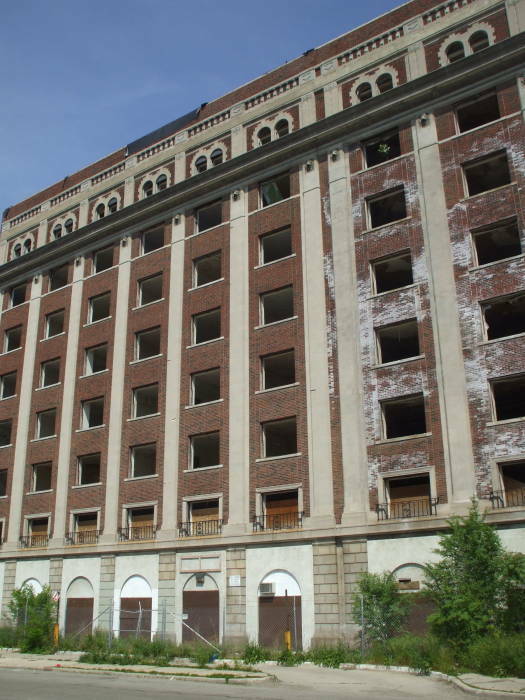 The front 35 feet of the building was removed in 1934, when Woodward Avenue was widened to its current size. And, the exterior was heavily renovated in 1966. But people have been bowling here since 1913. The Majestic Theatre is next door, to the left in this view. It opened in April, 1915, seating 1,651 people in what then was the world's largest theatre built for showing movies. The theatre closed, was used for a while as a church, and then as a photographic studio. Then it sat empty for ten years. The present owner purchased it in 1984, and it now hosts mostly a variety of musical concerts. 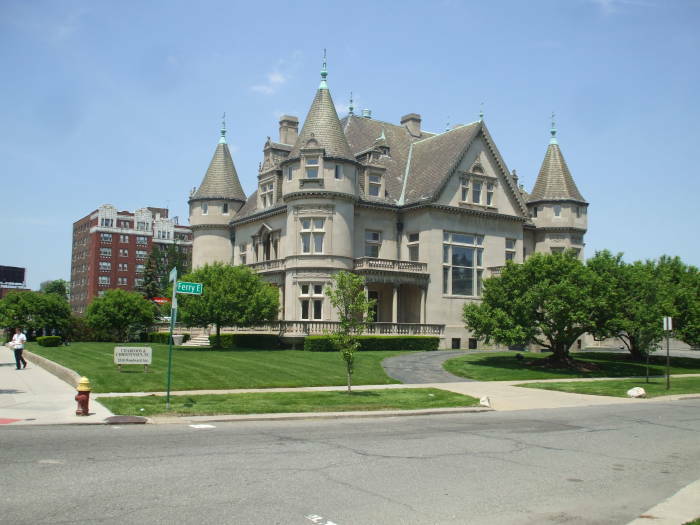 The Colonel Frank J. Hecker House is at 5510 Woodward Avenue, at Ferry Street. Hecker was a Union Army officer during the Civil War. He organized the Peninsular Car Company and made a fortune selling railroad supplies. He was back in the Army during the Spanish American War, 33 years later. Theodore Roosevelt appointed Heckler to the Panama Canal Commission in 1904. He also served as the Police Commissioner of Detroit, organized several midwestern banks, and was on the boards of several Detroit industrial businesses. He started building this home in 1888, basing its design on the Château de Chenonceaux near Tours, France. Construction material includes English oak for the lobby, Egyptian Nubian marble and onyx for the fireplaces, and Italian Sienna marble in the vestibules. He hosted elaborate parties here, with Presidents William McKinley and Rutherford Hayes on the guest lists. Hecker lived here until he died in 1927. The Hecker family owned it through 1947, operating it as a boarding house for college students. They sold it to the Smiley Brothers Music Company, who used the space for musical instruction and practice and also sold musical instruments. It has been home to the Charfoos & Christensen law firm since 1990. It also houses the Royal Danish Consulate. 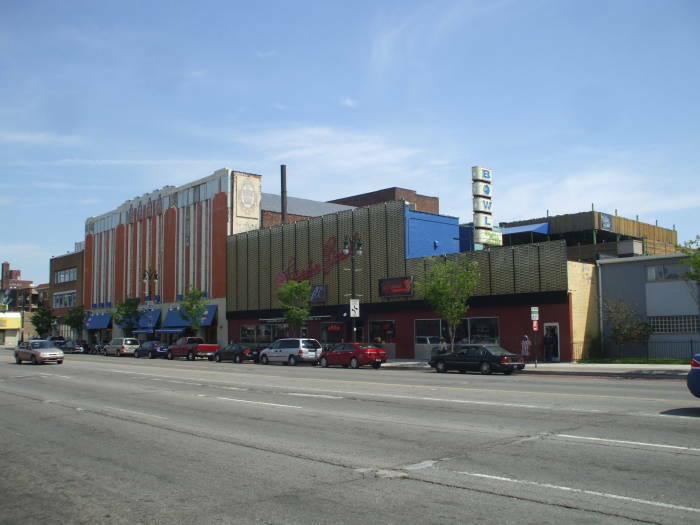 I continued north along Woodward Avenue to cross over I-94, also called the Edsel Ford Freeway. This put me in the New Center area, where West Grand Boulevard crosses Woodward Avenue. The Fisher Building, with its green pyramid shaped peak, had been visible from downtown, but now I was getting close to it. The massive Cadillac Place began to loom up in front of it. I'm about to cross under the Canadian National rail line. 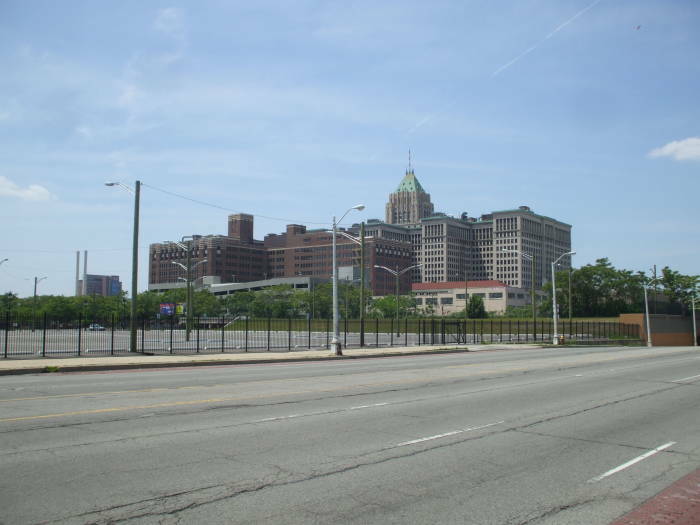 The light colored one-story building just right of center is the current Amtrak station, a far cry for the Michigan Central Station in its glory. Amtrak's Wolverine runs between Chicago and Detroit, three times per day in each direction. It's a 7.5 hour trip, making one of the three departure times inconveniently early and one of the three arrival times inconveniently late. Cadillac Place was constructed between 1919 and 1923. 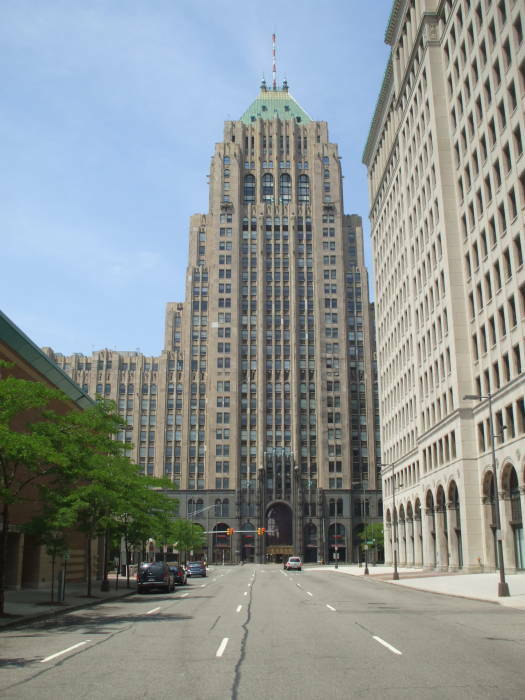 It was built as the permanent headquarters of General Motors. Oh, how plans change. William Durant had founded General Motors in 1908. The company's Board of Directors had to apply a great deal of pressure to get him to construct a headquarters building. One wing of the huge E-shaped building was ready for occupancy in late 1920, while the rest of the building construction continued. The entire complex was to have been named after Durant, but a 1921 power struggle forced him out. 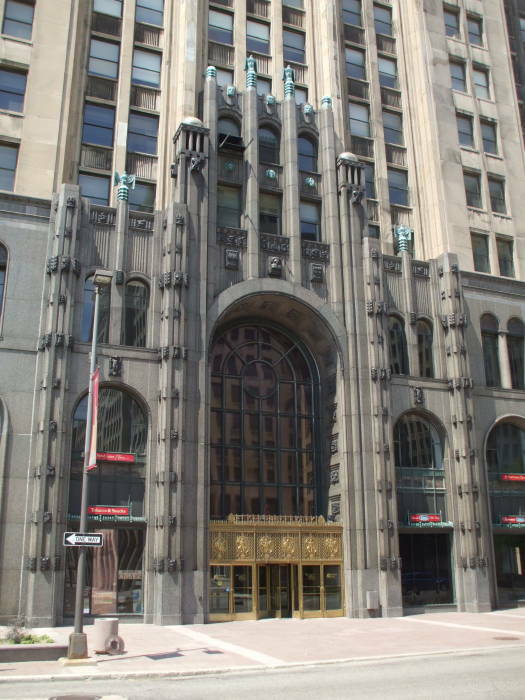 The building was renamed Cadillac Place, but an ornamental D had already been carved above the main entrance and several other places. The final structure is enormous: 15 stories, total height of 220 feet, 1,398,000 square feet of floor space. It's more than an E shape as there are four 15-story wings extending from the main backbone paralleling West Grand Boulevard (just three are visible here). This design allows natural light and ventilation to reach every office. Cadillac Place fully opened in 1923 as the second-largest office building in the world, behind the Equitable Building in New York. The relatively low five-story Annex, with the red peaked roof and windows in dark columns, was the original home of General Motors Laboratories. The Annex was built soon after the main building was finished. Those laboratories moved in 1930 across Milwaukee Avenue to the red brick Argonaut Building, at the far left. 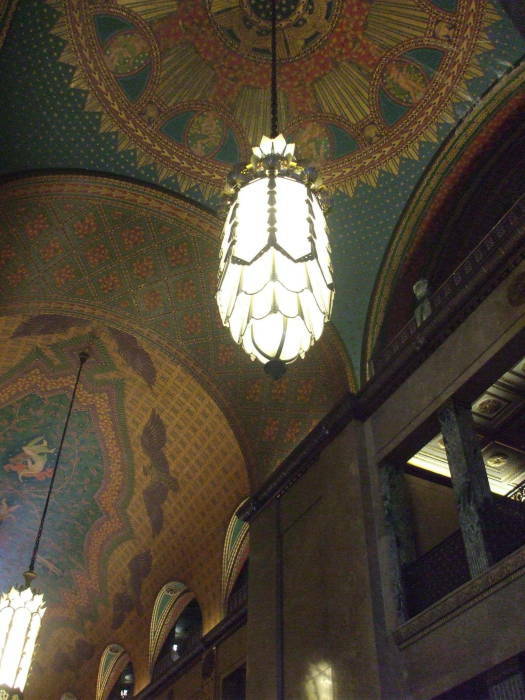 The Fisher Building was completed in 1928. 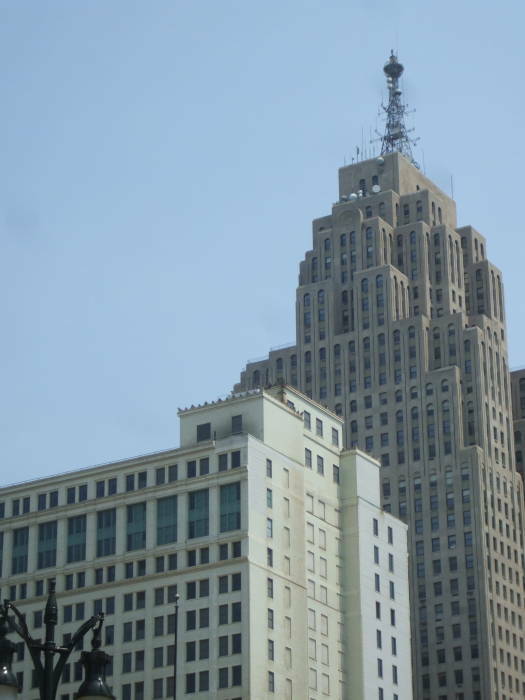 It's an ornate Art Deco skyscraper that is called "Detroit's largest art object". The Fisher family had founded a company that built car bodies. They sold Fisher Body to General Motors and built this office and retail building with the proceeds. The tower has 30 stories, with its roof top at 428 feet. This, however, was just the start. The original plan was for this tower to be matched with a second 30 story tower, the two of them flanking a 60 story central tower! However, the Depression hit within a year of the completion of what we see today, stopping the grand plan. The tower is called the Golden Tower, as it was originally covered with gold gilded tiles. 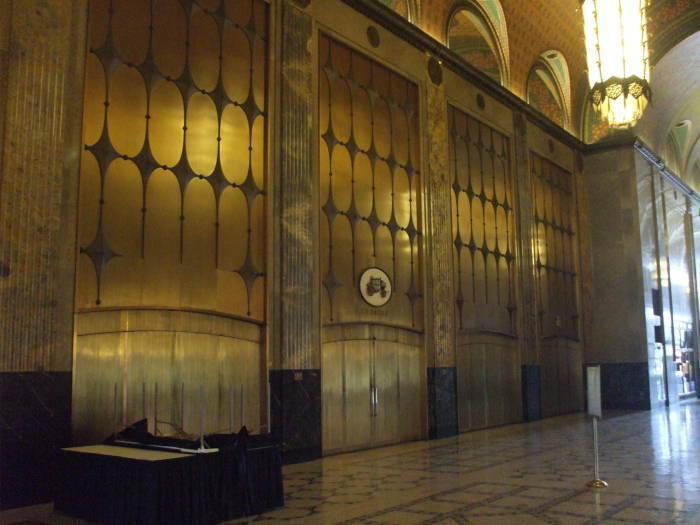 The gold tiles were removed during World War II due to fears that they made the building a beacon for enemy bombers. They were replaced with green terracota tiles. Lower levels are still faced with limestone. Here we see the main entrance off West Grand Boulevard. 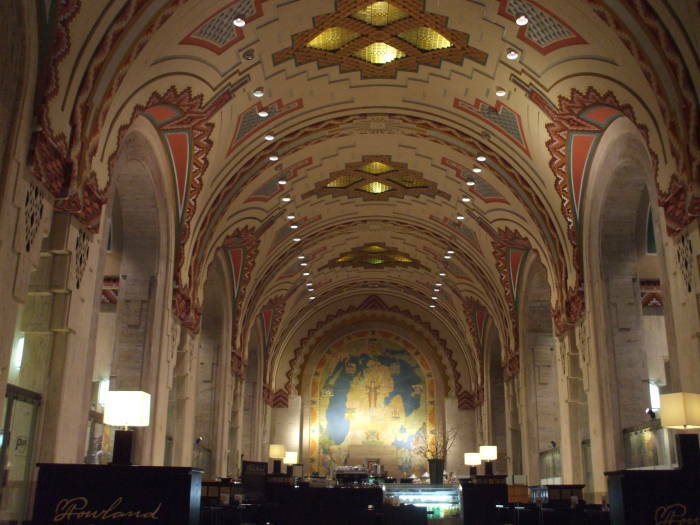 The main lobby is three stories tall with an elaborately decorated barrel vaulted ceiling. The building houses the Fisher Theatre. It was an opulent live theatre with 3,500 seats. It was decorated in an Aztec theme with Mexican-Indian art and banana trees housing live macaws that the patrons could feed. After the Depression, the Fisher Theatre operated as a movie theatre for the most part. The banana trees and macaws had been removed. In 1961 the theatre was renovated, modifying it into a 2,089 seat playhouse with more spacious seating and internal lobby areas for the audience. The decor was changed to a far simpler mid-century design. 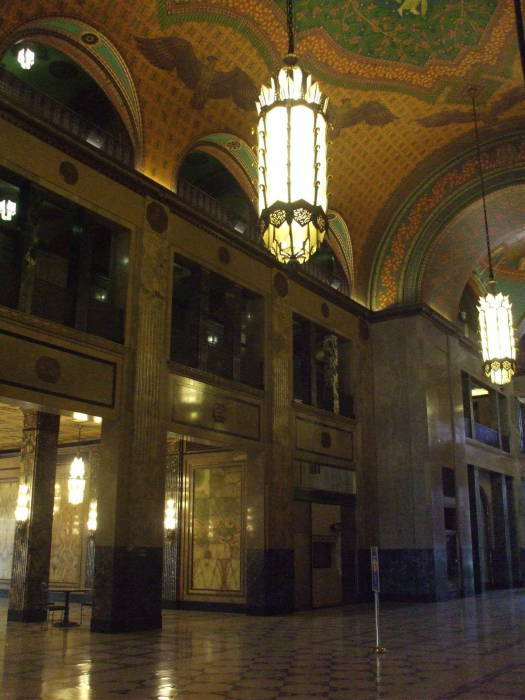 Many people find that the 1961 decor now seems far more dated than the elaborate Art Deco lobby! The lobby decoration is made from forty different varieties of marble. The Hungarian artist Géza Maróti designed and carried out the decor. The Book Building was built in 1916-1917 on the central Washington Boulevard through downtown. It was a just a fairly simple rectangular block of a 13-story office building, the relatively low part extending to our right in the picture at left. The Book Building was built in an Italian Renaissance style, at least as far as that applies to 13-story office blocks. But what was to follow would be far more elaborate. In 1926 the Book brothers finished their Book Tower addition to the northwest end of that office building. 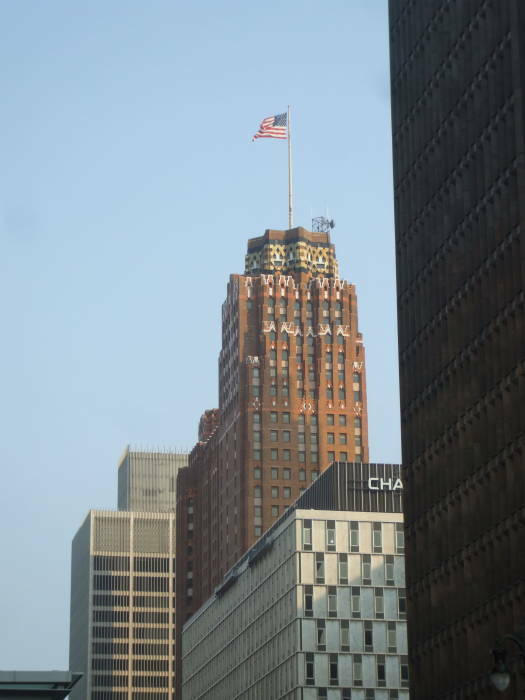 At 36 stories and 475 feet, it was the tallest office building in Detroit for two years. 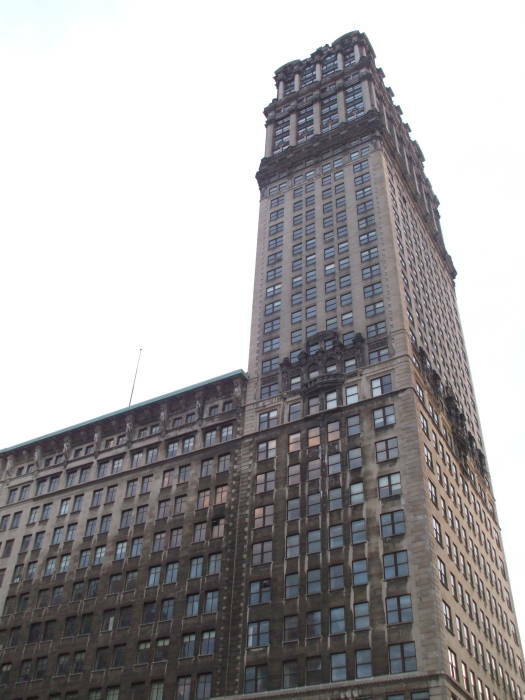 It held that rank until the Penobscot Building's completion in 1928. The tower's design becomes increasingly more complex toward its top. Academic Classicism is the formal label. It includes intricately carved Corinthian columns (far more elaborate than the simple Doric or Ionic), scrolls, and crests. Horizontal bands of Italian Renaissance decoration circle it at various heights. One difficulty with the design of any tall and narrow building is the simple fact that an increasing proportion of its cross-section at any level must be dedicated to providing the rest of the tower with ventilation, electrical power, water and waste plumbing, and access between the floors. Louis Kamper, the architect, neglected to consider the need for adequate fire evacuation during the design process. So, a large external staircase was added. The entire structure was faced with an especially porous limestone that quickly accumulated airborne pollutants. As you can see at left, the original Book Building was built in a tight U shape, providing some light to the offices near its core. The Book brothers had planned for another tower at the other end, but the Great Depression ended that plan. Elaborate columns and other decorations wrap around the tower at the 13th floor, the top level of the main building. Another dozen floors continue above that, and then things get progressively more ornate toward the top. The Book Tower remained a prestigious address through the 1970s, but its fortunes declined through the 1980s. Businesses were moving out. In March 1986, a large mast holding a set of microwave antennas was blown off the roof onto Washington Boulevard, loosening several 300-pound pieces of decorative stone cornice. The Travelers Insurance Company was the principal mortgage holder on the building in 1988, and it took the building's owners, the Book Building Associates, to court. They were unable to pay the remaining $4 million, leading Travelers to sell the building in March 1989 to John Lambrecht. Lambrecht was a popular investor and civic leader who had previously purchased and renovated the nearby Cadillac Tower. He had similar plans for the Book Building and Tower, but he committed suicide later that year. His widow, Susan Lambrecht, took over the continuing expensive renovations. 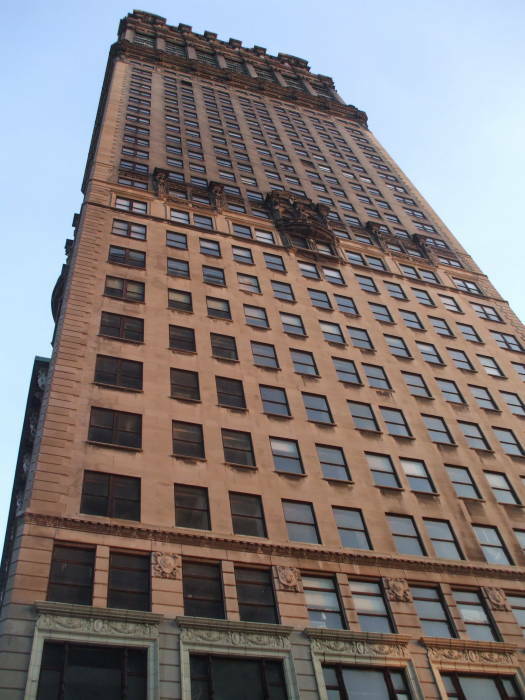 New York investor Charles Starace took an option in 1992 to buy the Book Tower within three years for $2-3 million. Within a year the unpaid electrical bill was about $23,000, and Detroit Edison was threatening to disconnect the power. The building's offices were down to about 50% occupancy, but Starace insisted that the operation was financially sound. Starace settled his utility bill within one day of the utility's deadline, and Susan Lambrecht retained ownership of the building. She sold the Book Building and Tower in 2006 to the Pagan Organization (really! ), a real estate investment group of New York. They added some retail space and converted some of the upper office to residential. The Pagan Organization formed the Northeast Commercial Services Corporation to manage the building. But that corporation filed for bankruptcy within a year, in May 2007. The last tenant was Bookie's Tavern, which closed its doors on January 5, 2009. 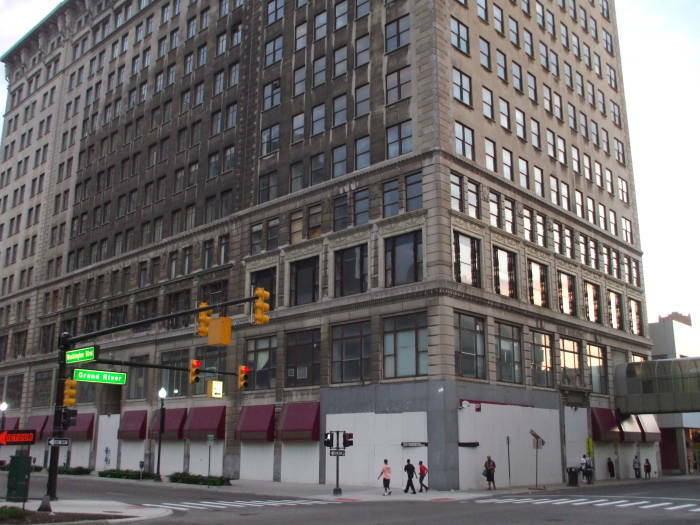 That same week the Detroit Free Press reported that the building's owner owed $87,000 in back electrical bills and $18,593 for water and sewage. The Book-Cadillac Hotel, now owned and operated by the Westin chain, was built starting in 1923. It was completed and opened in December 1924, the tallest building in the city and the tallest hotel in the world. It has 29 floors, and is just over 106 feet tall. It has a steel skeleton, with the lower six floors faced in limestone and beige brick on the floors above. It had 1,136 guest rooms, and the public spaces on the first five floors held three ballrooms, three dining rooms, and a ground floor retail arcade in addition to its spacious lobby. 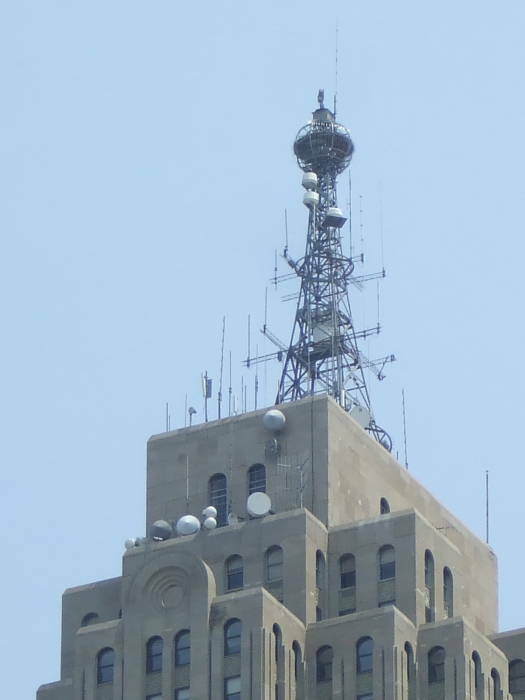 Radio station WCX, the predecessor to WJR, was based on the hotel's top floor. The Book brothers had also built this building, but they lost the hotel during the Depression when the banks foreclosed on the property in 1931. It continued operation as a hotel under different ownership and management. 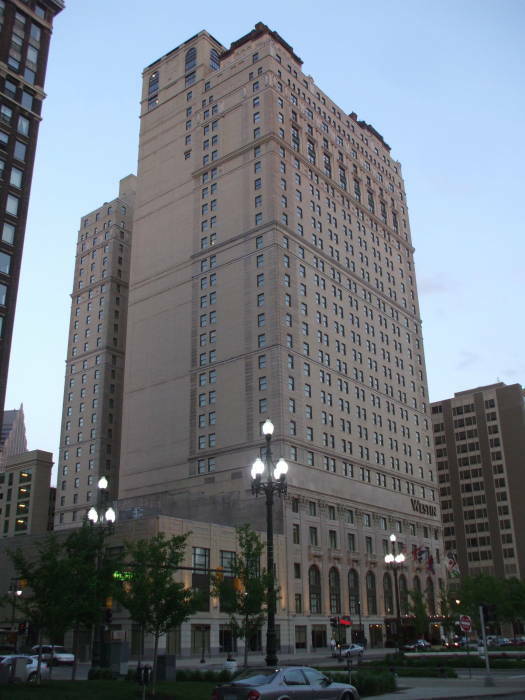 Sheraton bought the property in 1951, extensively renovating the building and renaming it the Sheraton-Cadillac. They rebuilt most of the public spaces, except for the ballrooms and the Italian garden, and replaced the grand staircase with escalators. The building changed hands again in 1975, in 1976, and again in 1979. It had been considered the city's top hotel for several years, but the owners at that time announced that they would close it because of the decreasing occupancy. The city was scheduled to host the 1980 Republican National Convention, and did not want to lose even more hotel space. So, the city entered into a partnership with the owners to keep the hotel open. The 1,100 guest rooms remaining in use, designed to the standards of the early 1920s, were considered much too small in 1983. Plus there were far too many of them to keep the hotel anywhere near full. The hotel was closed in October 1984 for a modification and renovation that was to convert it into a 12 floor hotel with 550 rooms, and 11 floors of office space. But construction costs were climbing rapidly and Detroit's economic situation continued to worsen through the 1980s. The property was sold off in 1986, the retail businesses moved out, and the building was closed for twenty years. Vandals, scavengers, and the weather gradually destroyed the building from 1986 through 2003. The city then announced a deal to renovate the structure, but it quickly stopped when the construction crews found that the structure was even more damaged than they had expected. Finally, a new renovation plan was announced in 2006. The work was done from August 2006 through the grand re-opening in October 2008. It's now a Westin hotel with 455 rooms, plus 67 condominium units priced $280,000 and up. Some of the original decor has been recreated in the grand ballroom. 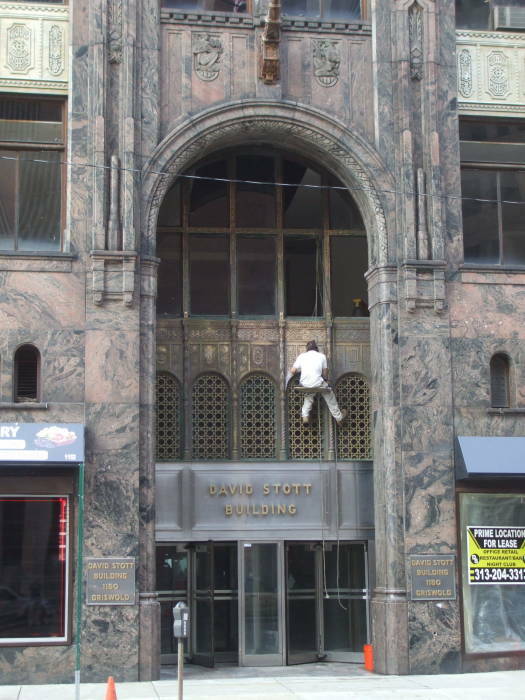 The David Stott Building is another Art Deco skyscraper in downtown Detroit. It was built in 1929. 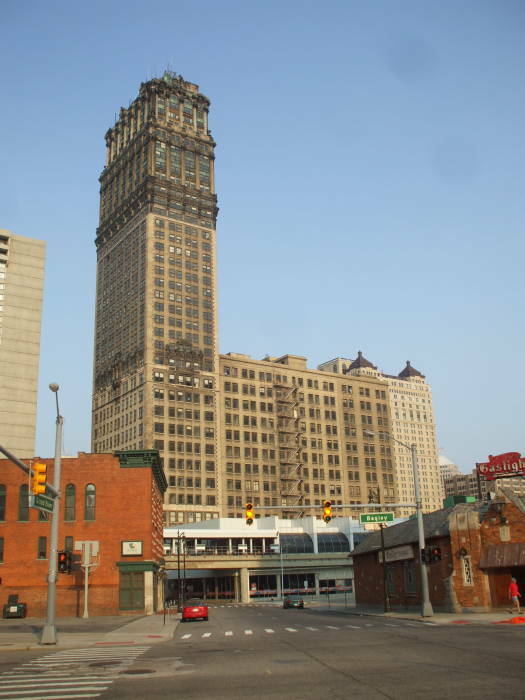 It was named after a Detroit businessman who owned a mill and was on the board of several other companies. There's no prize for guessing what his name was. 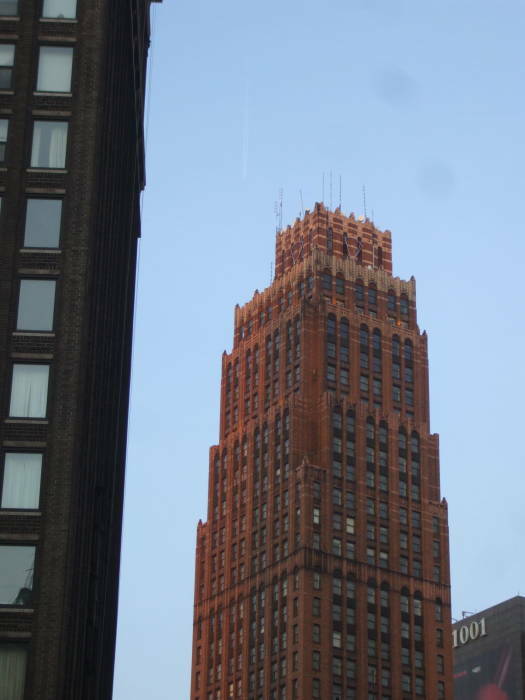 The David Stott Building has 37 stories above ground level, plus three below. It has a red granite base and incorporates some marble on its first three floors. Above that it's faced in red brick. 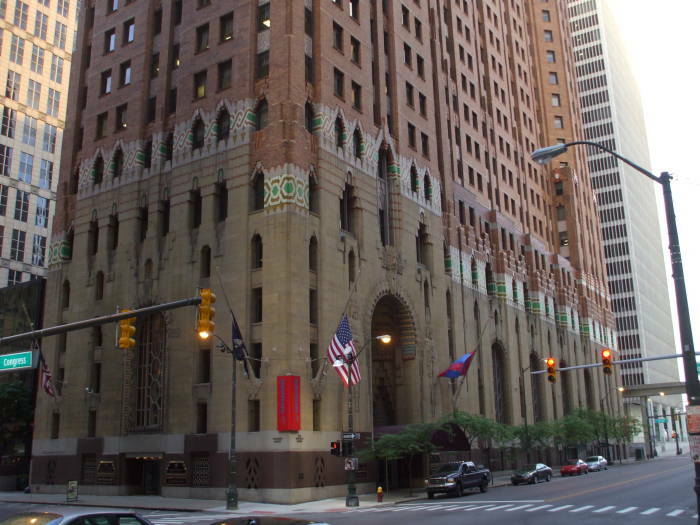 It has architectural sculpture by Corrado Parducci, like many other Detroit buildings of the 1920s. If you are designing a building to incorporate large areas of decorative brass, you need to provide some means of access for cleaning it from time to time. Looking south along Griswold Street toward the river, we see three Art Deco skyscrapers from the prosperous 1920s. 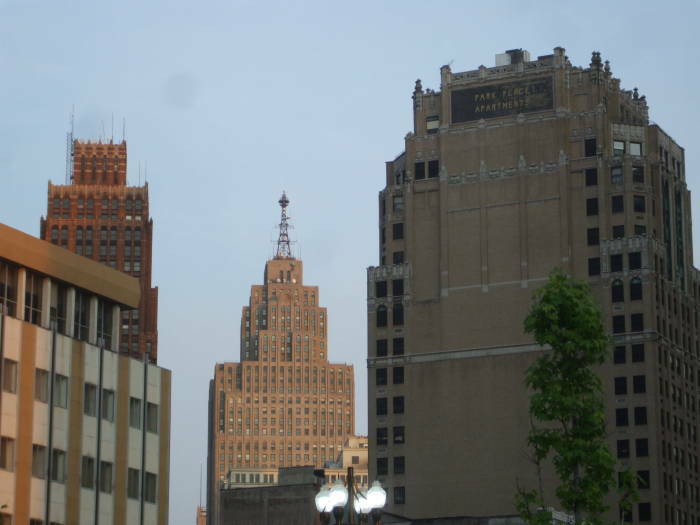 From left to right they are the David Stott Building, Guardian Building, and Penobscot Building. The Penobscot Building appears here at a distance, between the David Stott Building and the rather battered Park Place Apartments. 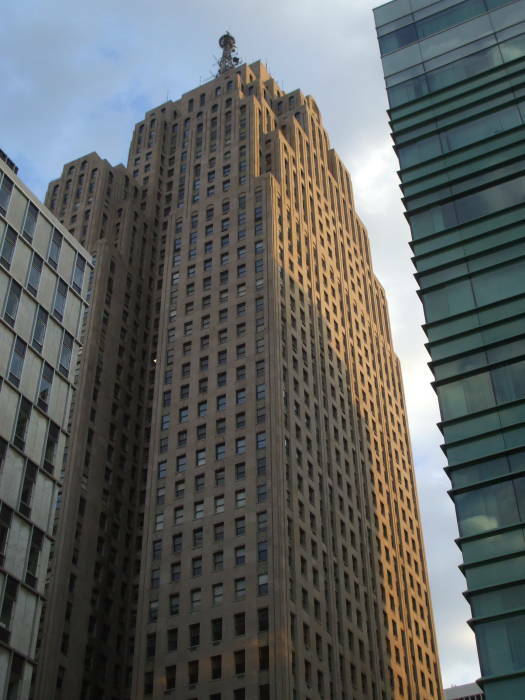 It's another 1920s Art Deco skyscraper, finished in 1928. 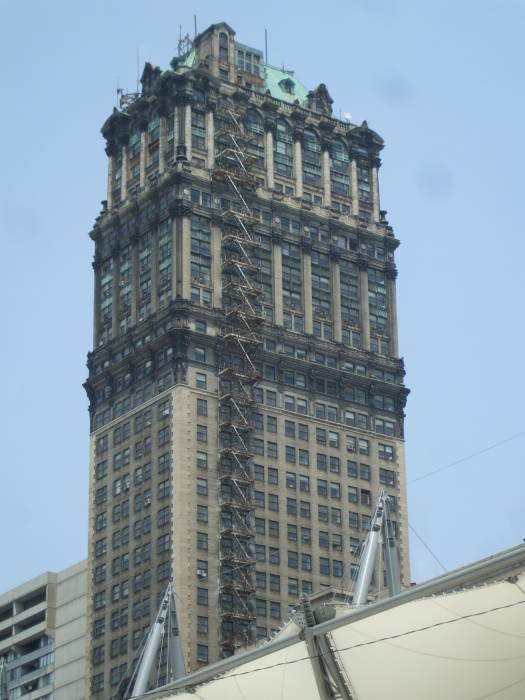 At 45 stories above ground and a roof at 565 feet, it was the tallest building in Detroit until 1977. When it was completed in 1928, it was the eighth tallest building in the world and the tallest outside New York and Chicago. The sides are sheer to the 30th floor, and then a series of setbacks begin, making the upper floors progressively smaller. The peak hosts a large number of VHF/UHF repeater and remote antennas, plus several microwave dishes for point to point links. The main mast and its large red spherical beacon at the top date from the original 1920s design. Like many Art Deco buildings from the 1920s, the main plan is in an H shape providing natural light and ventilation. 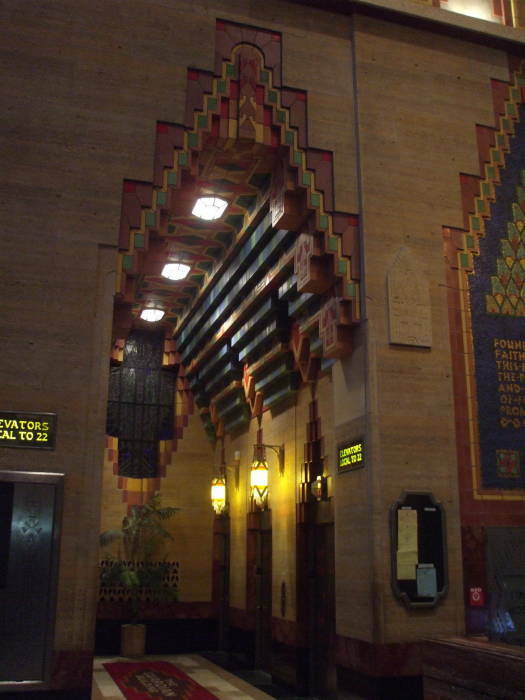 The main entrance has some Native American styled decoration. The building was named for a Maine tribe. The large arched window makes you expect a grand four-story lobby. However, notice the fluorescent lights showing through the mostly dark window. The lobby beyond these doors is small, with a low ceiling. The second, third, and fourth floors continue across behind this window. 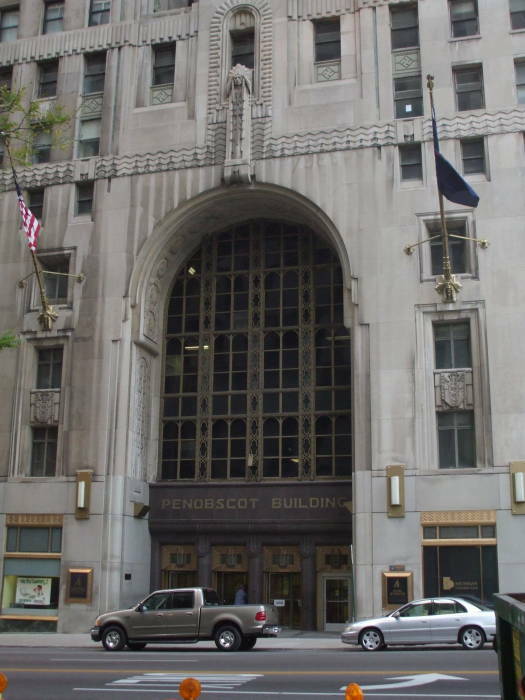 The Penobscot Building is in the crowded Financial District, and it's hard to see very much of it at one time. This view is looking down Monroe Street, over the Campus Martius traffic circle and park to the Penobscot Building. 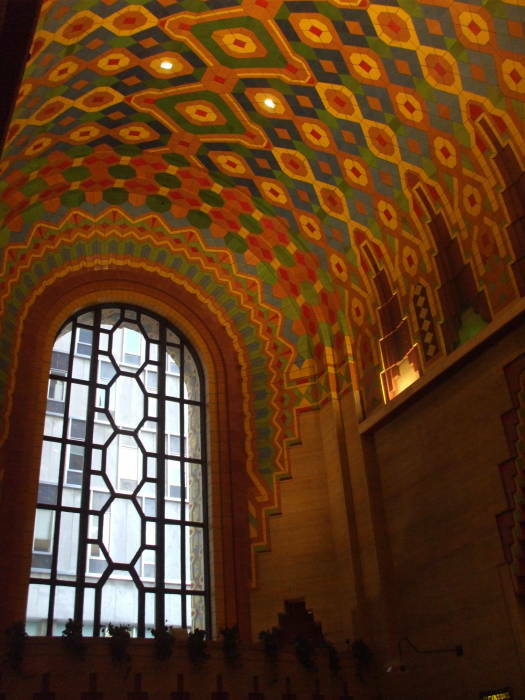 The Guardian Building is the most spectacular Art Deco skyscraper in down town. Here you see the Guardian to the left and the and Penobscot Building to the right. The upper floors step back, requiring you to be some distance away to see its onate top. It's 36 stories and 496 feet tall. The exterior is largely brick with decorative work in limestone, tile, and terra cotta. 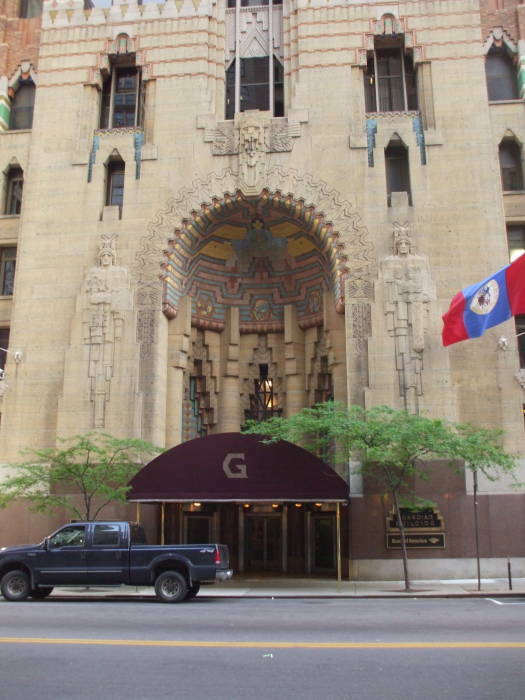 The Guardian Building was built in 1928-1929, originally as the Union Trust Building. 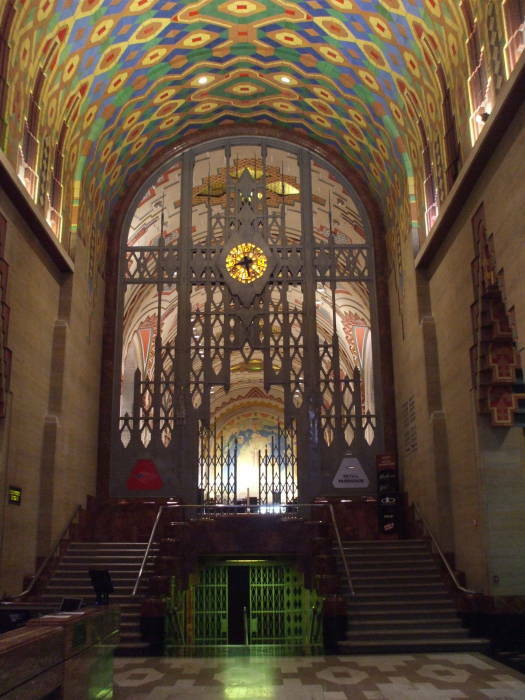 It has been nicknamed the Cathedral of Finance, which becomes more obvious when you see the interior, shown below. The large flag at its top was flying at half-mast on another day. Michigan native and euthanasia enthusiast Jack Kevorkian had just died (ironically, of natural causes) so maybe this was in honor of him. The bottom four floors are all in limestone, with Native American bas reliefs. The two floors above that mix limestone, tile, terra cotta, and brick. Here you see three Native Americans represented in the building's exterior at the Griswold Street main entrance. Two tall standing bas reliefs stand on either side of the arch, and the arch's half-dome has a tile representation. 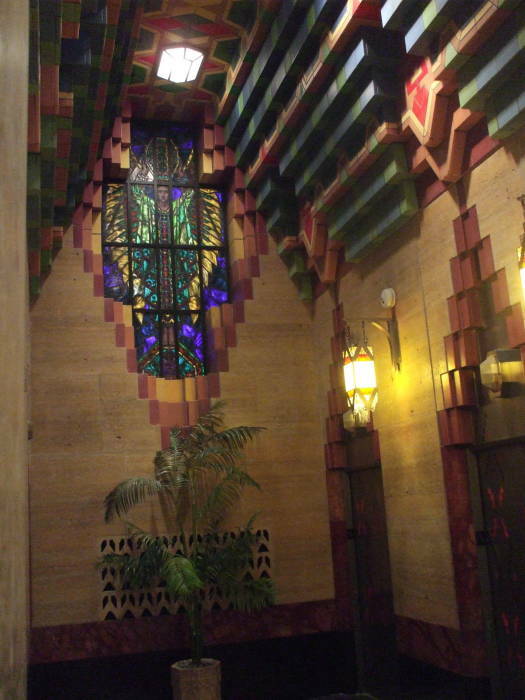 The interior is decorated in brightly colored mosaic and tile. 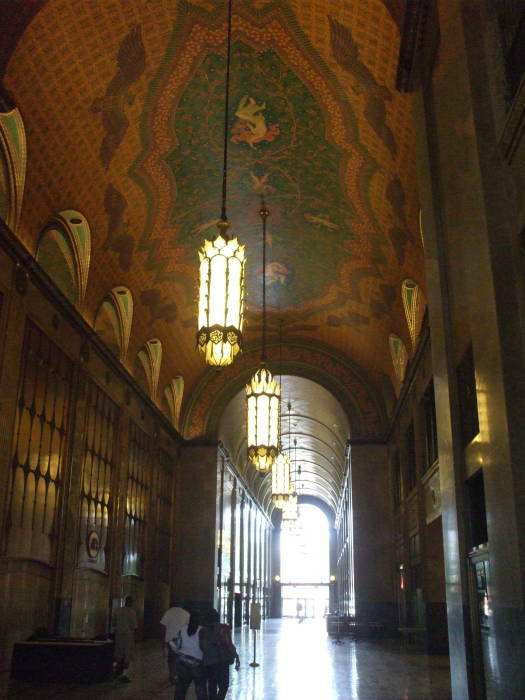 The Guardian Building was headquarters for the U.S. Army's offices directing vehicle and aircraft construction during World War II. 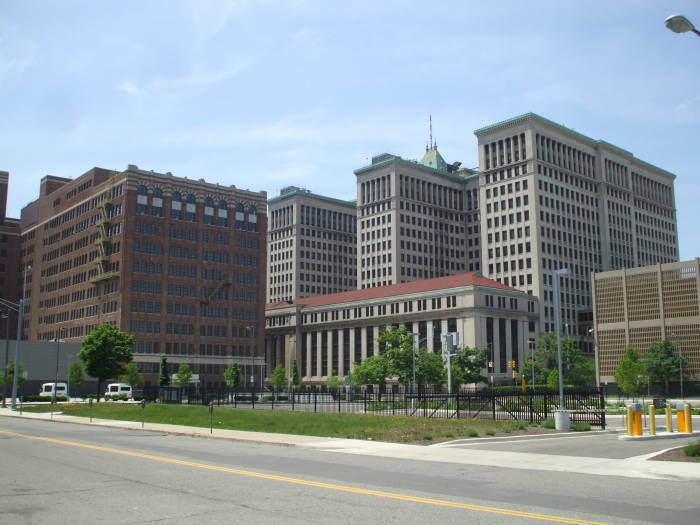 Detroit was called the Arsenal of Democracy for its prodigious wartime production. The Ford plants were building one B-24 every hour, 600 per month with the plants running three shifts around the clock. Japanese Admiral Isoroku Yamamoto believed that Japan could not win an long war with the United States. Although he planned the Pearl Harbor attack, he felt that the attack was a mistake made even worse by the bungling of the Japanese Foreign Ministry making it an unprovoked sneak attack during peacetime. While it seems that he never said "I fear all we have done is to awaken a sleeping giant and fill him with a terrible resolve", as his character does in the movie Tora! Tora! Tora!, that does seem to have captured his thinking. 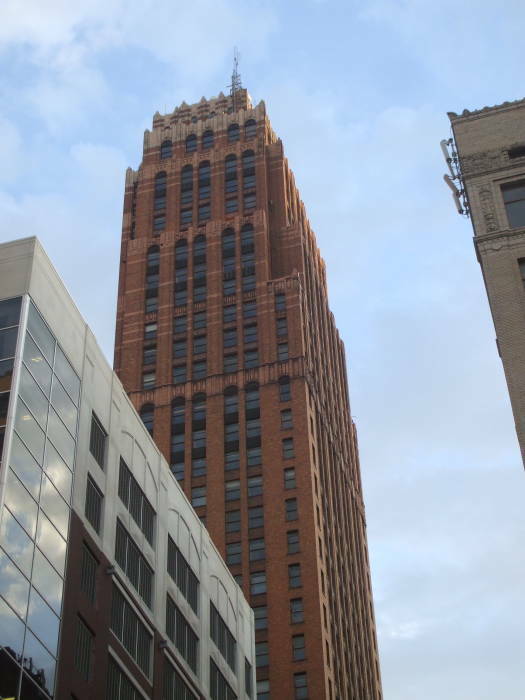 The government of Wayne County agreed to purchase the Guardian Building, and it will move its office out of the current Wayne County Building when the deal goes through. One Detroit Center is the latest skyscraper in Detroit. It was built in 1991 through 1993. 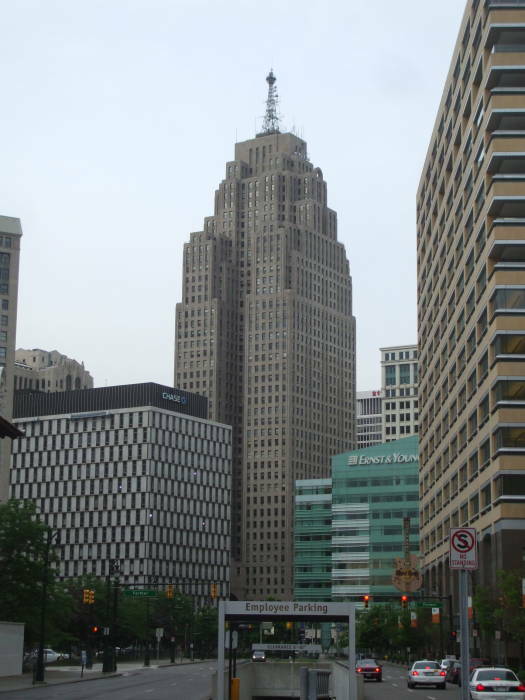 It's now the tallest office building in Detroit, and the second tallest building overall behind the central tower of the Renaissance Center, seen below. 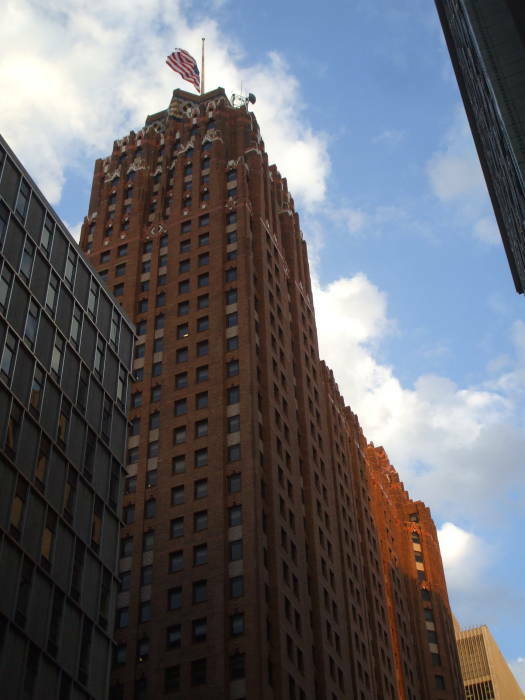 One Detroit Center has 43 floors, two less than the 45 of the Penobscot Building. 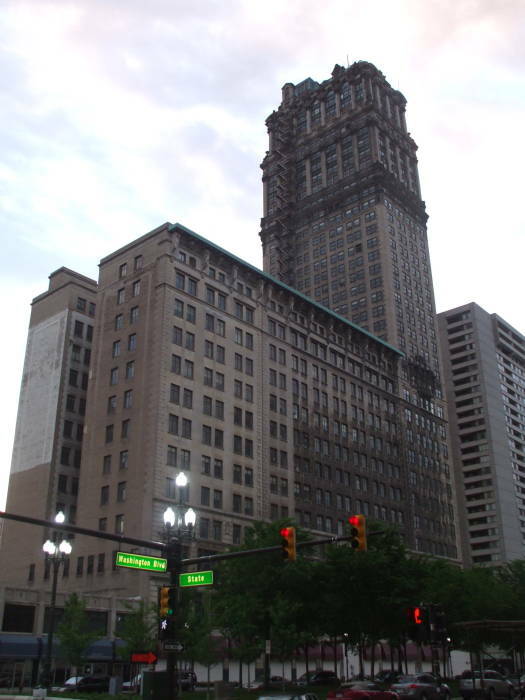 However, One Detroit Center's floors are taller and yield a roof that peaks at 607 feet, about 60 feet taller than that of the Penobscot Building. The main tenant of the building has been Comerica. However, they moved their headquarters to Dallas, Texas, and have announced that they will leave when their lease runs out in 2012. The several law firms and other banks now in the building will have room for their expansion, and the building may be renamed. The design is intended to be neo-gothic, with spires like those in old Flemish buildings. Finally, there is the Renaissance Center. Locals call it the Ren Cen. The main structures of the Renaissance Center are the 73-story (727') central tower and the four 39-story (522') office towers surrounding it. All of that opened in 1977. Lots of poured cast concrete. Leonid Brezhnev may have had those Soviets pouring a lot of concrete back in the 1970s. But we can show them how to really pour concrete. The central tower was designed as, and still is, a hotel. It was the tallest hotel in the world when it opened in 1977. That was a time when Kuala Lumpur was an obscure southeast Asian city, Shenzhen was little more than a farming village in southeastern China, and Dubai was an impoverished Persian Gulf emirate that had been a British protectorate until just six years before. It's still the tallest hotel in the Western Hemisphere, but skyscraper building has largely moved to Asia. The six tallest hotels in the world are all in the city of Dubai; number 7, 11, and 12 are in Bangkok; number 8 is in Hong Kong; number 9 is in Macau; and number 10 is in Chongqing. If you're trying to find that city in your atlas, you might find it spelled Chungking. The sculpture we're looking past depicts Joe Lewis' arm. The 1980 Republican National Convention was held in Detroit, nominating Ronald Reagan as the eventually successful Presidential candidate. 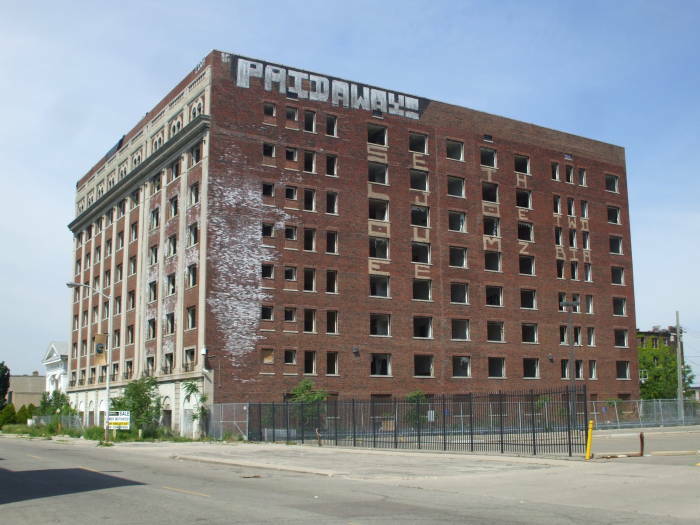 I wonder if Detroit was picked to play up the issue of economic malaise. The convention itself was held at the nearby Joe Lewis Arena, but for some reason you see a lot of attention paid to the fact that Reagan, his Vice-Presidential running mate George H. W. Bush, and former President Gerald Ford stayed in the central tower hotel. 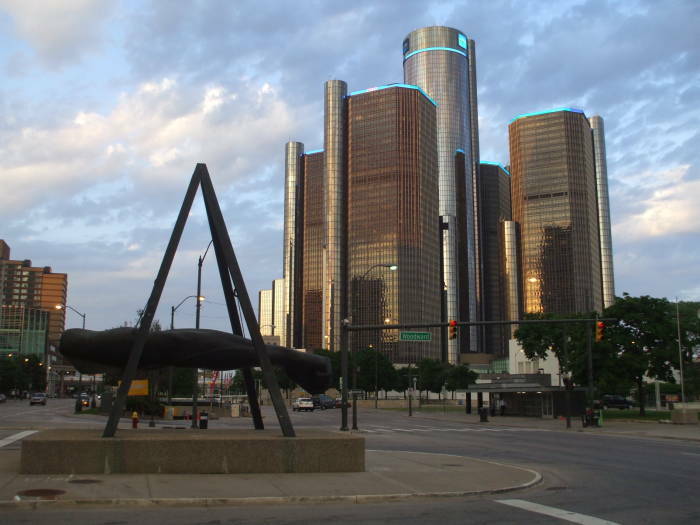 General Motors purchased the Renaissance Center in 1996, moving its headquarters from Cadillac Place over the following five years. The Marriott chain manages the central hotel. 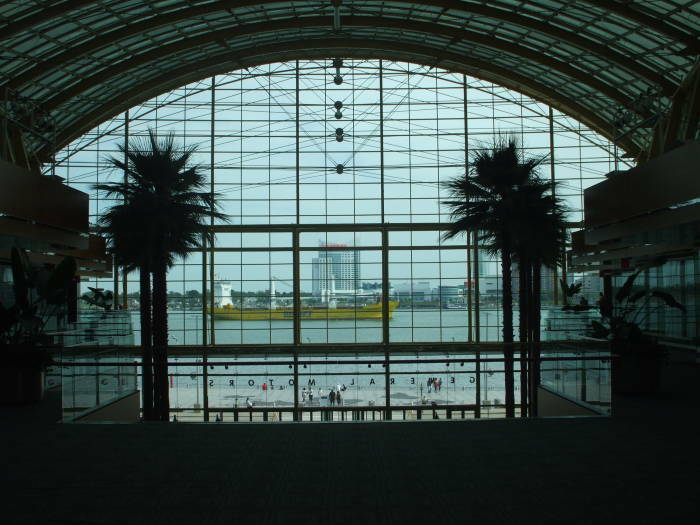 The five story glass atrium on the river side looks across the Detroit River, which drains Lake Superior, Lake Michigan, and Lake Huron toward the Atlantic. Windsor, Ontario is directly across the river. Here we see a large lake freighter passing downstream. The Detroit River itself is just 32 miles long. Lake Huron drains via the Saint Clair River into Lake Saint Clair, which then drains via the Detroit River into Lake Erie. It discharges about 188,000 cubic feet per second, about 5,325 cubic meters per second. Windsor lies to the south of Detroit, the only place other than around Niagara Falls where you cross the border to the south to cross from a U.S. city to a Canadian one. The French explorers in the 1670s named the waterway the Rivière du Détroit, meaning the River of the Strait. Detroit. Détroit. The Strait. That's what it means. Over its history, the city of Detroit has presented seven people with the keys to the city. Well, two of them are fictional characters: Santa Claus and Elmo from Sesame Street. 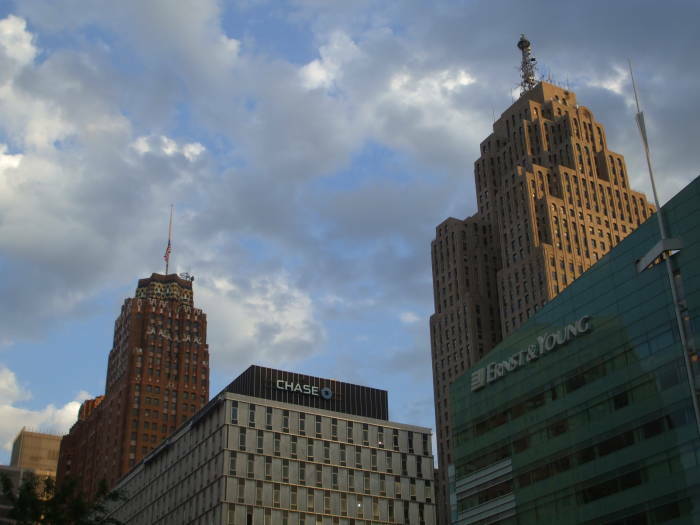 The five actual people who have been presented with the keys to the city of Detroit are: the actor James Earl Jones, the neurosurgeon Benjamin Carson, a football star, a sports team owner, and Saddam Hussein. No, really. In 1979, the Reverend Jacob Yasso of the Chaldean Sacred Heart congratulated Saddam Hussein on his presidency. In return, Hussein sent the church $250,000. Deputy Prime Minister Tariq Aziz was Chaldean, and there are tens of thousands of Chaldeans living in the Detroit area. Yasso was sent to Baghdad in 1980 by the Detroit mayor. After receiving the keys to the city, Hussein donated another $200,000 to the church.